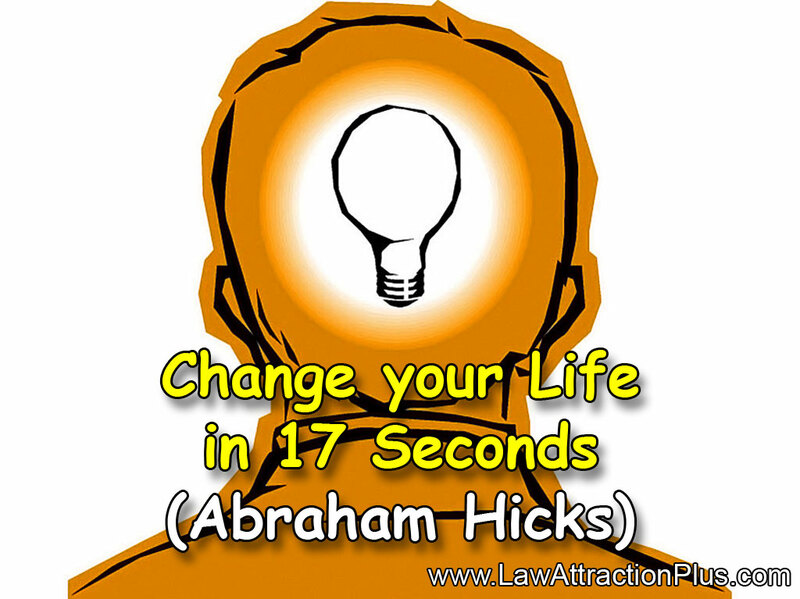 Change your life in 17 seconds (Abraham Hicks) | Law of Attraction Plus: The Secret revealed! Align your life as frequently as you can. If at least two or three times a day you stop to think and find 17 seconds of pure thought about anything, then you will have done enough for your day to be productive. Abraham Hicks says a thought reaches enough fuel when you center for attention for 17 seconds (17 seconds of pure concentration). 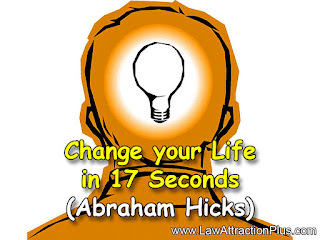 That thought will bring with it another one that, by effects of the Law of Attraction, will be more powerful, and after another 17 seconds (34 seconds in total) the thoughts evolve into a level of energy even more powerful. Later, if you add another 17 seconds (51 in total), the process continues. If you finally can continue until a total of 68 seconds (in any aspect of your life that you wish) then you will have done a great job and that wish is on its way to its realization. The key is pure positive focus (pure positive energy) with no resistance at all and without allowing any thought of lack and negativity in that period of 68 seconds. Abraham says that the average person rarely finishes an affirmation (or the formulation of a wish) without offering contradictory energy (opposite thought to what they're wishing or doubtful thought). For example:"I want a new car... but they're so expensive, besides I don't think I have enough money..."
So most of us haven't experienced this process of pure 68 seconds of non-contradictory energy. If we learned to use this process of non-contradictory pure thought for only 68 seconds, then the work hours or the action would become irrelevant. How to achieve 17 seconds of pure thought? It's easier to do it in writing or spoken to achieve 17 seconds of concentration in a pure thought. If you're going to do it in writing, do it in the way of a letter meant for a friend, pretending that everything you're wishing for has already happened. Then describe your feeling in every detail and you immerse yourself in the description so much that it seems like you're really living it. Another way of doing it is to gather a group of people and talk about something you wish in the future, talk about it as if the wish has already come true. For example, if you want to have a beautiful wedding, talk about how much you liked the reception, the band, the cake, the decoration, etc. This spoken exercise between friends can last more than 68 seconds, it usually lasts between 5 to 20 minutes. We recommend you start to do this exercise with things that are not so important to you, that way over time you'll get enough concentration ability (and your doubt level will lower). 68 seconds are equal to 2 million hours-man... Do you believe this? If not, then you're missing the opportunity to use all this wisdom to your benefit.